I’ve recently become interested in Nixie tubes. Nixie tubes are neon filled glass tubes that contain cathodes in various shapes, numbers being the most common, and a mesh anode. Passing a current through the cathode causes the neon gas to ionize which makes it light up. The problem with these tubes is that they voltages of around 170V in order to ionize the gas. Fortunately, most tubes only need a few mA which makes the supply design simpler and easy to run off a wall wart. My goal here is to create a power supply that is cheap and works well enough to power 4 IN-17 tubes for a direct drive Nixie tube clock. My design is based on the power supply used in the ArduiNIX. A search of the web shows that their power supply design is quite common. I took their design and incorporated the suggestions Nick De Smith gives in his own Nixie tube design tutorial. Nick’s supply is nice but it is expensive. However, his suggestions are useful. 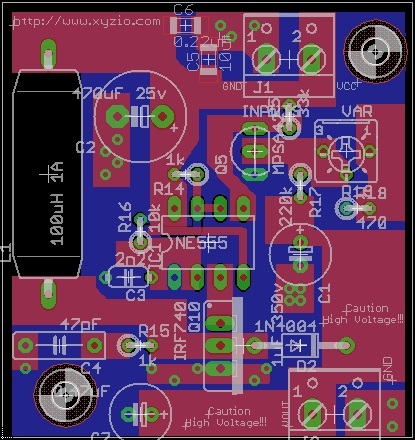 I added a solid ground plane except around the inductor and used multiple vias to connect to ground for low resistance paths. I used large traces and expanded them to a plane wherever possible to further reduce resistance. In addition I added capacitors to the input (C5, C6) and output (C7) to help smooth ripples. I put the components as close together as possible and also changed the output diode to a UF4004. Why switch the diode? Because it was cheaper. So is the supply cheap? The total component cost is $7.75. Is it possible to make it even cheaper? Yes. You can directly solder your wires to the board and omit the terminal connectors (J1, J3 – $1.64). You can also omit the input/output stabilizing capacitors (C5, C6, C7) and the IC socket for the 555 timer and save another $0.53. This brings the total down to $5.58. The board size is 1.8 x 1.9 inches. Assuming that you live in the US and pay $ 1.67/sq inch for your PCBs, you can build one for about $13.50 (or $11.29 with reduced components). And, it only gets cheaper if you make more. The supply uses a traditional switch mode topology. The 555 timer switches inductor L1 to ground and diode D2 through transistor Q10. L1 charges up when it is connected to ground and then acts like a current source to force charge through D2 when Q10 is off. This charge build up on capacitor C1 provides the desired output voltage. Potentiometer R19 and transistor Q5 form a feedback loop that control the 555 timer’s switching frequency. that this supply is adequate. Constructing the supply is simple. Solder the indicated components into their proper places on the board. It should take about 30 mins to assemble. Once it is assembled, connect yourinput power supply to header J1 and a multimeter to the output header – J3. The input supply should be around 9v. Plug in the input power supply. THIS INVOLVES HIGH VOLTAGES THAT CAN KILL YOU, SO DO NOT TOUCH THE HIGH VOLTAGE PORTIONS OF THE BOARD. 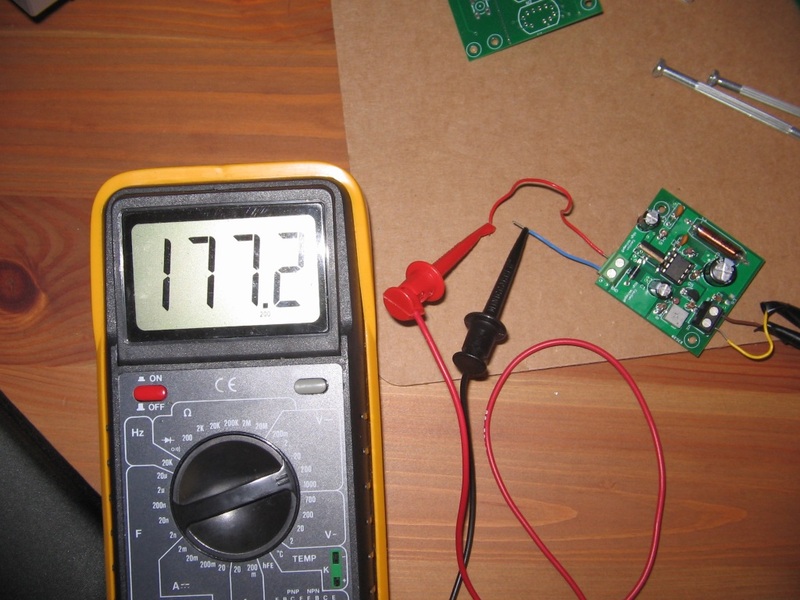 Look at your multimeter – it should read somewhere between 90V and 200V. Adjust potentiometer R10 until you reach your desired voltage. As you do this, pass your hand over the supply – you should feel no heat. If it feels hot, or if the output voltage is low or wildly oscillating then you have a short or misplaced component. CAUTION – Unplug the board before you check your work. Hey D, some of the boards I’ve gotten from OSHPark don’t have enough solder mask between VCC (J1, pin 1) and the ground plane as well as VOUT (J2, pin 1) and the ground plane. So it is very easy to bridge to power pins to ground. You can work around this by minimizing the solder you use on those pins or by re-sizing the ground plane. I haven’t tried it but you should also be able to flip over the IO connectors. I’m still waiting on the boards to ship from OSH. I’ll let you know what I find in my batch. Thanks for the heads up. It sounds like some careful soldering in these two areas will allow me to use the boards ‘as-is’.without scraping away ground plane. I’m not sure what you mean regarding the suggestion fo “flip over the IO connectors”. Hey D, yes be careful with the solder. For the ‘flip over the IO connectors’, what I meant was to solder the screw terminals onto the bottom of the board so they are on the opposite side. The ground plane is only on the bottom and so there will be less chance of bridging. On the eagle files the C3 cap is listed as 2n2, or 2200pf but the mouser parts list has C3 as 5.6pf as does the arduinix. Which is the correct value? Hi Erik, Thanks for contacting me. The correct value is 5.6pF. I’ve updated the no-planes board files. Thanks for the details for this power supply board. However, several of the components in your Mouser parts list are now obsolete or require several thousand pieces minimum for order. Do you plan on any update to utilize components that are current as of April 2015? Thanks you! Hi Kenneth – Thanks for pointing that out. I updated the component list to parts that are available at Mouser. Hi Roger, Sorry. I don’t sell these. I cannot compete with mass produced supplies. Check out the AurdiNIX (http://arduinix.com) or look for similar supplies on Ebay.